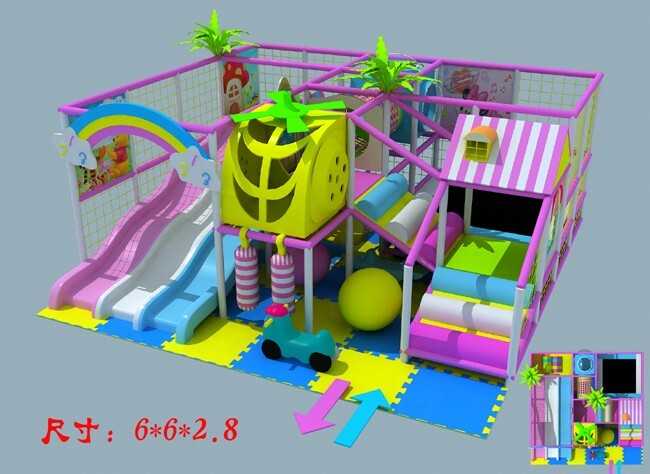 This Indoor Play equipment design for kids under age six years old, Usually have large play set near it for bigger kids, for this small design we also make lot of play events like 3 lane fiber glass slide, trampoline, car station and tunnel etc. Kids also can play on first floor with some small toys. Success is something that many people strive for, but that not everyone among us attains. When we consider the various factors that play a role in determining whether a person is successful or not, ambition and action are two of the first to come to mind. Some parents may think it is uncomfortable for their kids to be so ambitious. However, we can't deny it is a fact that being ambitious for children doesn't mean that he has to sacrifice all his innocence of a kid, instead, proper ambition is of great benefit to promote children's development. But where can we train children to be ambitious and at the same time make them feel happy? Maybe the most suitable place is the indoor jungle gym. To begin with, ambition serves to motivate and guide us in our daily life. The provided us with the focus and direction that enables us to work towards complicating a sordid goal, objective or task. A young kid who decides to be a basketball player may take all the spare time in his daily life to practice it. Without any aspiration, he might not feel so enthusiastic about achieving his goal and instead will waste all his time playing computer games. Indoor jungle gym not only provides him with a good place to realize his dream but also leave him a lot of time when they can practice without interruption. While ambition serves as the motivating and organizing force that keeps us going and guides us along our path, action enables us to transform our aspirations from a state of latent potentiality into one of manifest reality. To take action means to carry out an intention or execute a plan. Clear as we are to learn the fact that the path to success needs to be paved with effort and action. However, children today are reluctant to pay action to achieve, especially those who grow up in well-off families. But I believe it is through people's own action that they can taste the sweetness of success. In indoor jungle gym, achieving a goal while they are doing activities needs kids to make actions, action make kids feel happy and meanwhile helps to keep them bearing in mind the importance of action. In general, ambition and action are both essential in determining whether we flourish or fall behind. The former gives us the drive and direction to move forward, while the latter enables us to implement our vision and make things happen. And both of the two characters can be learned in indoor jungle gym.